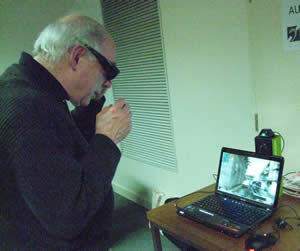 Tonight we had a real innovator in PC technology with us. 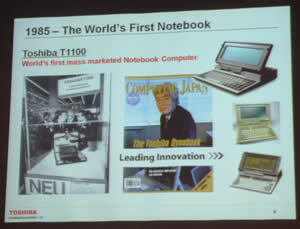 Most companies have some claim to that but only Toshiba, with 25 years experience can claim to be the first company to market the laptop computer. 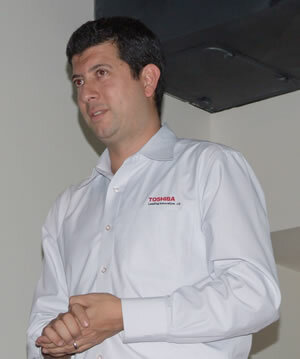 Anthony Geronimo,Production Manager Toshiba Consumer Division gave the group an insight into Toshibas influence on the Laptop computing world. 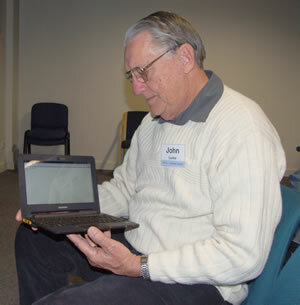 1985 saw them introduce the first laptop, the T1100 and in 1986 the first laptop with a hard drive. Toshiba remained ahead of the game for some years with the following releases. 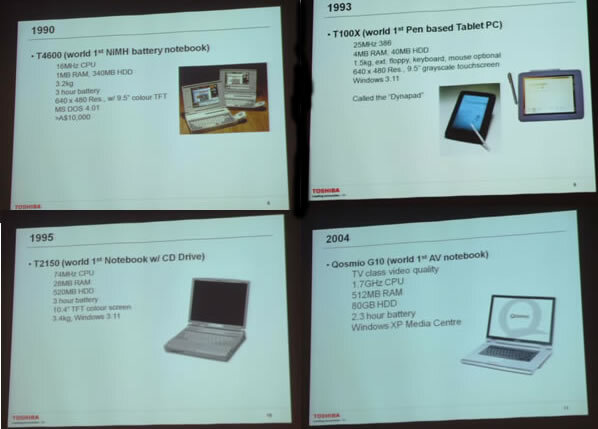 The introduction of the NIMH battery in 1990, the first pen based laptop in 1993, the first CD drive in 1995 and in 2004 the first AV notebook. 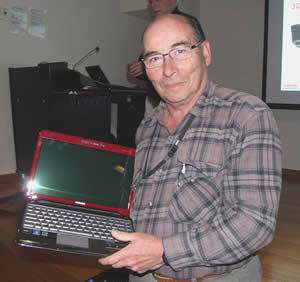 In 2009 Toshiba won the Greenpeace award for the world’s greenest computer. Now after 25 years in the business, Toshiba is releasing a range of portable computers to cover evey need or demand of the consumer. 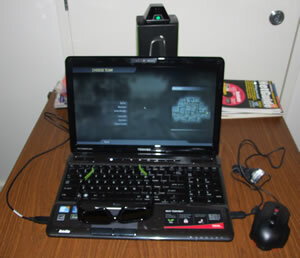 This computer is a wonderful compromise between the netbook and a book reader. It has two screens and no keyboard. 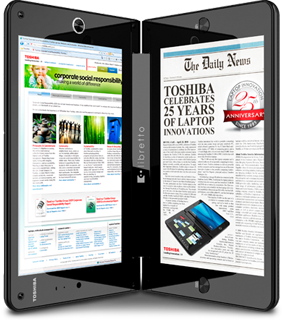 A simple press of a button turns one screen into a virtual keyboard for your computing needs or the second page of the book you need to study. 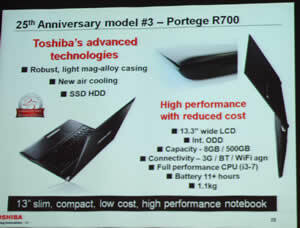 Next was the Portage R700 range of light weight notebooks. This range has a 13.3 inch screen, a DVD drive and comes in a range of CPUs from the i3 to the i7 with standard hard drives from 320 to 500 GB. 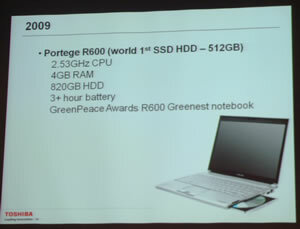 The Portege range also includes a 128 GB SSD. Cloud computing is where you keep your software in the clouds. 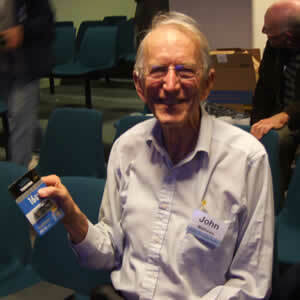 or Microsoft Office Live available through Microsoft Live both of which are made available free once you register. 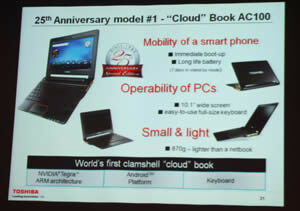 Running on the Android operating system the AC 100 has been designed as a bridge between the smartphone and the netbook. 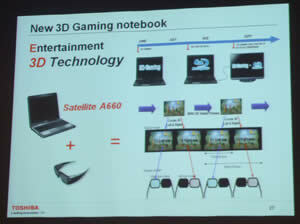 The most entertaining laptop was the 3D gaming offering. 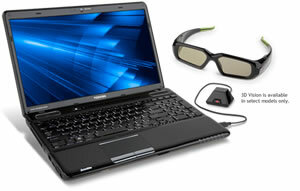 The Toshiba A 660 laptop comes with a 3D camera which works with the 3D glasses to provide the a real depth to the image. 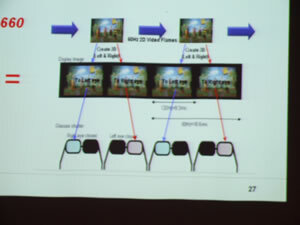 The glasses have a built in battery and work by switching the signal between lenses rather than using a polarising filter. Hidden in Anthony's bag was what looked suspiciously like a iPad. 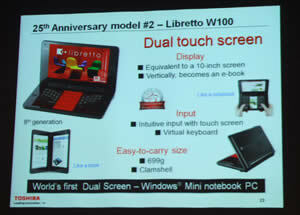 It was however a dummy of the new Folio 100 Toshiba's entry into the handheld tablet market running on Android. 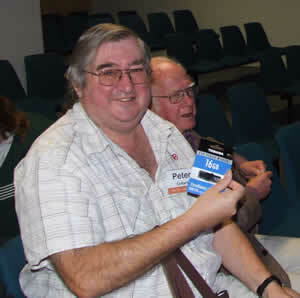 Sydney PC User Group Inc. © 2008 Last updated: Sun. 3 Oct. 2010.